Updated: Added AT&T details. / Corrected terms of T-Mobile trade-in discount. An earlier version indicated a phone payment plan was not required; it is. 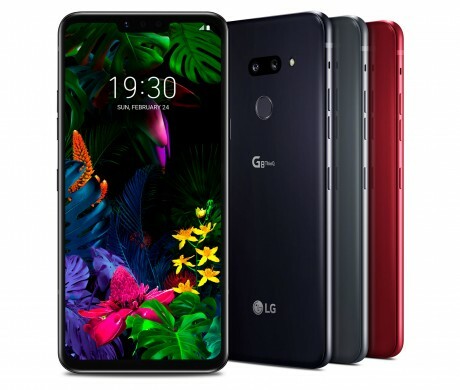 In two weeks, the LG G8 ThinQ will be offered by all major US carriers, with several offering major discounts at launch. This flagship phone from LG has a unique 3D depth camera on the front, supporting mid-air gestures, hand vein scanning, and 3D face scanning. Verizon, AT&T, T-Mobile, Sprint, US Cellular, and Xfinity Mobile will carry the G8, as well as Best Buy and B&H. The standard retail price is $820, although some carriers are offering significant discounts and deals. Read on for carrier deal specifics, color options, and pre-order dates. Verizon is offering several separate deals (which can be combined): When activating a new line and buying the G8 on a payment plan, customers will get a $350 discount. Customers new to Verizon, buying the G8 on a payment plan and signing up for an eligible unlimited plan will receive a $200 prepaid MasterCard. Old-phone trade-in offers include $450 on a new line or $200 on an existing line. Customers purchasing an accessory bundle ($100 or $150) with their G8 will receive a $100 Verizon gift card. Verizon will carry the Aurora Black and Platinum Gray colors. Verizon will accept pre-orders starting April 1st, with full launch on April 11th. T-Mobile will offer the G8 in Aurora Black or Carmine Red. T-Mobile will accept pre-orders starting April 5th, with full launch on April 12th. AT&T is offering a 2-for-1 deal: when customers buy an LG G8 on a 30-month payment plan and add a new line, they get a free LG G8. AT&T is accepting pre-orders tomorrow, March 29th, with shipments arriving in less than five business days. It will be available in stores April 12th. The LG G8 ThinQ has some futuristic new features, like complex mid-air hand gestures and hand vein scanning. Otherwise it's similar to the G7, but makes numerous small upgrades and refinements. The new LG G8 ThinQ has a 3D depth camera on the front that can sense and recognize detailed hand gestures such as turning a virtual knob in mid-air. The same sensor also provides two different kinds of biometric security: hand vein scanning and 3D face scanning. LG's V50 ThinQ is the first 5G phone for Sprint, and the first phone in the US to use 5G on low-frequency bands that provide broad coverage. LG took the V40 and somehow added both 5G and a larger battery, without making it any bigger.